Pons-Moll, G., Baak, A., Gall, J., Leal-Taixe, L., Mueller, M., Seidel, H., Rosenhahn, B.
Weiss, A., Hirshberg, D., Black, M.
The 3D shape of the human body is useful for applications in fitness, games and apparel. 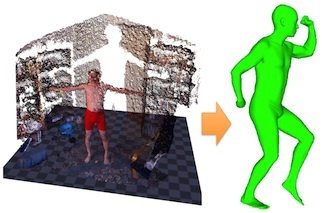 Accurate body scanners, however, are expensive, limiting the availability of 3D body models. We present a method for human shape reconstruction from noisy monocular image and range data using a single inexpensive commodity sensor. 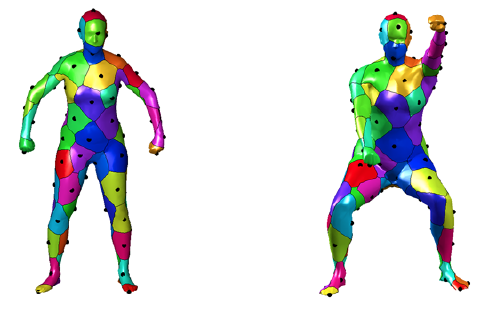 The approach combines low-resolution image silhouettes with coarse range data to estimate a parametric model of the body. Accurate 3D shape estimates are obtained by combining multiple monocular views of a person moving in front of the sensor. To cope with varying body pose, we use a SCAPE body model which factors 3D body shape and pose variations. This enables the estimation of a single consistent shape while allowing pose to vary. Additionally, we describe a novel method to minimize the distance between the projected 3D body contour and the image silhouette that uses analytic derivatives of the objective function. 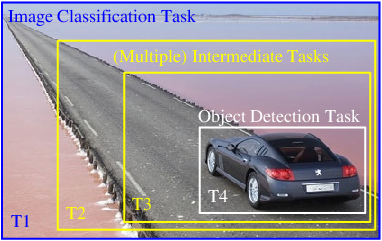 We propose a simple method to estimate standard body measurements from the recovered SCAPE model and show that the accuracy of our method is competitive with commercial body scanning systems costing orders of magnitude more. Leal-Taixé, L., Rosenhahn, G. P. A. B.
Hirshberg, D. A., Loper, M., Rachlin, E., Tsoli, A., Weiss, A., Corner, B., Black, M. J. 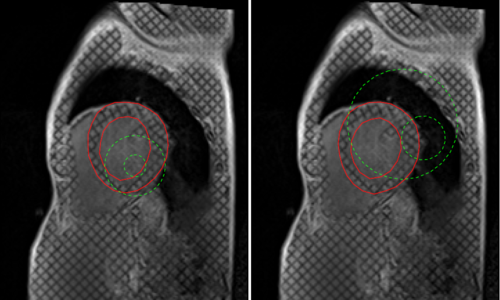 The statistical analysis of large corpora of human body scans requires that these scans be in alignment, either for a small set of key landmarks or densely for all the vertices in the scan. 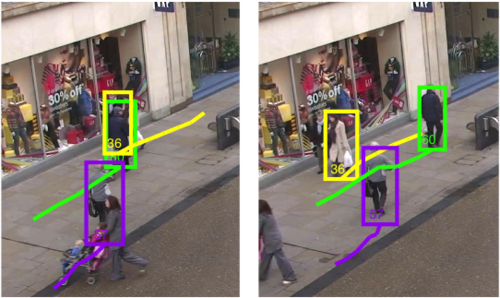 Existing techniques tend to rely on hand-placed landmarks or algorithms that extract landmarks from scans. The former is time consuming and subjective while the latter is error prone. Here we show that a model-based approach can align meshes automatically, producing alignment accuracy similar to that of previous methods that rely on many landmarks. Specifically, we align a low-resolution, artist-created template body mesh to many high-resolution laser scans. Our alignment procedure employs a robust iterative closest point method with a regularization that promotes smooth and locally rigid deformation of the template mesh. We evaluate our approach on 50 female body models from the CAESAR dataset that vary significantly in body shape. To make the method fully automatic, we define simple feature detectors for the head and ankles, which provide initial landmark locations. We find that, if body poses are fairly similar, as in CAESAR, the fully automated method provides dense alignments that enable statistical analysis and anthropometric measurement. Pons-Moll, G., Leal-Taixé, L., Truong, T., Rosenhahn, B.
Hochberg, L., Simeral, J., Black, M., Bacher, D., Barefoot, L., Berhanu, E., Borton, D., Cash, S., Feldman, J., Gallivan, E., Homer, M., Jarosiewicz, B., King, B., Liu, J., Malik, W., Masse, N., Perge, J., Rosler, D., Schmansky, N., Travers, B., Truccolo, W., Nurmikko, A., Donoghue, J.
Dinuzzo, F., Ong, C. S., Gehler, P., Pillonetto, G.
Jampani, V., Vaidya, V., Sivaswamy, J., Tourani, K. L.
Pneumoconiosis, a lung disease caused by the inhalation of dust, is mainly diagnosed using chest radiographs. The effects of using contralateral symmetric (CS) information present in chest radiographs in the diagnosis of pneumoconiosis are studied using an eye tracking experimental study. The role of expertise and the influence of CS information on the performance of readers with different expertise level are also of interest. Experimental subjects ranging from novices & medical students to staff radiologists were presented with 17 double and 16 single lung images, and were asked to give profusion ratings for each lung zone. Eye movements and the time for their diagnosis were also recorded. Kruskal-Wallis test (χ2(6) = 13.38, p = .038), showed that the observer error (average sum of absolute differences) in double lung images differed significantly across the different expertise categories when considering all the participants. Wilcoxon-signed rank test indicated that the observer error was significantly higher for single-lung images (Z = 3.13, p < .001) than for the double-lung images for all the participants. Mann-Whitney test (U = 28, p = .038) showed that the differential error between single and double lung images is significantly higher in doctors [staff & residents] than in non-doctors [others]. Thus, Expertise & CS information plays a significant role in the diagnosis of pneumoconiosis. CS information helps in diagnosing pneumoconiosis by reducing the general tendency of giving less profusion ratings. Training and experience appear to play important roles in learning to use the CS information present in the chest radiographs. Gehler, P., Rother, C., Kiefel, M., Zhang, L., Schölkopf, B. We address the challenging task of decoupling material properties from lighting properties given a single image. In the last two decades virtually all works have concentrated on exploiting edge information to address this problem. 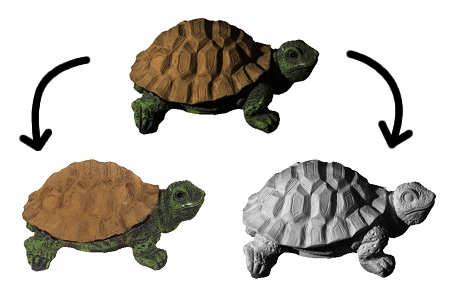 We take a different route by introducing a new prior on reflectance, that models reflectance values as being drawn from a sparse set of basis colors. This results in a Random Field model with global, latent variables (basis colors) and pixel-accurate output reflectance values. We show that without edge information high-quality results can be achieved, that are on par with methods exploiting this source of information. Finally, we are able to improve on state-of-the-art results by integrating edge information into our model. We believe that our new approach is an excellent starting point for future developments in this field. Nakasone, A., Tang, S., Shigematsu, M., Heinecke, B., Fujimoto, S., Prendinger, H.
Foster, J., Freifeld, O., Nuyujukian, P., Ryu, S., Black, M. J., Shenoy, K.
Sekunova, A., Black, M. J., Parkinson, L., Barton, J. S.
We propose a new level set segmentation method with statistical shape prior using a variational approach. The image energy is derived from a robust image gradient feature. 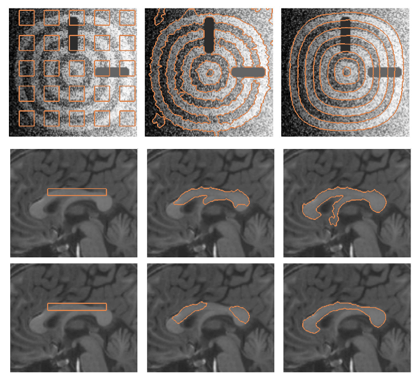 This gives the active contour a global representation of the geometric configuration, making it more robust to image noise, weak edges and initial configurations. Statistical shape information is incorporated using nonparametric shape density distribution, which allows the model to handle relatively large shape variations. 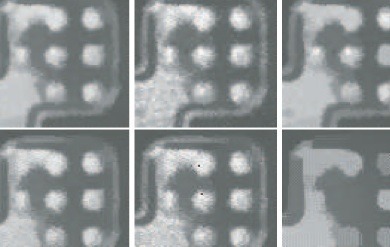 Comparative examples using both synthetic and real images show the robustness and efficiency of the proposed method. Xiang, B., Wang, C., Deux, J., Rahmouni, A., Paragios, N.
Zaheer, A., Akhter, I., Mohammad, H. B., Marzban, S., Khan, S.
Most nonrigid objects exhibit temporal regularities in their deformations. Recently it was proposed that these regularities can be parameterized by assuming that the non- rigid structure lies in a small dimensional trajectory space. 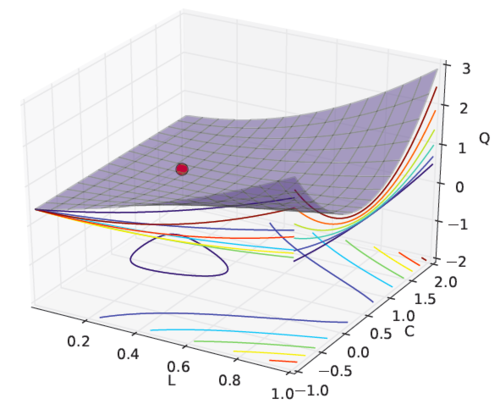 In this paper, we propose a factorization approach for 3D reconstruction from multiple static cameras under the com- pact trajectory subspace representation. Proposed factor- ization is analogous to rank-3 factorization of rigid struc- ture from motion problem, in transformed space. The benefit of our approach is that the 3D trajectory basis can be directly learned from the image observations. This also allows us to impute missing observations and denoise tracking errors without explicit estimation of the 3D structure. In contrast to standard triangulation based methods which require points to be visible in at least two cameras, our ap- proach can reconstruct points, which remain occluded even in all the cameras for quite a long time. 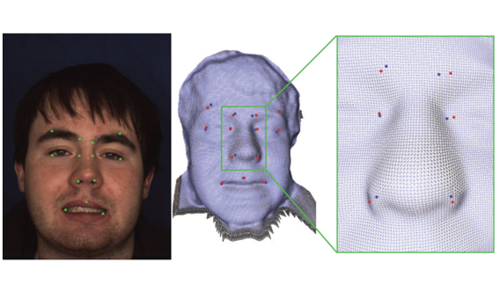 This makes our solution especially suitable for occlusion handling in motion capture systems. We demonstrate robustness of our method on challenging real and synthetic scenarios. Kuhne, H., Jhuang, H., Garrote, E., Poggio, T., Serre, T.
Franquemont, L., Vargas-Irwin, C., Black, M., Donoghue, J. Foster, J., Freifeld, O., Nuyujukian, P., Ryu, S., Black, M., Shenoy, K.
Tsoli, A., Black, M. J. 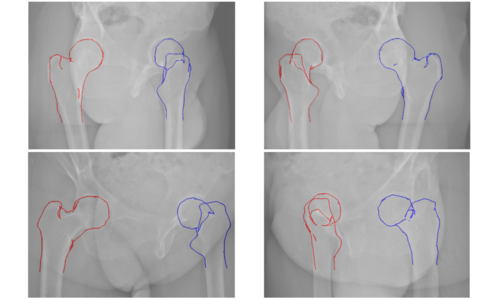 Correspondence between non-rigid deformable 3D objects provides a foundation for object matching and retrieval, recognition, and 3D alignment. Establishing 3D correspondence is challenging when there are non-rigid deformations or articulations between instances of a class. We present a method for automatically finding such correspondences that deals with significant variations in pose, shape and resolution between pairs of objects.We represent objects as triangular meshes and consider normalized geodesic distances as representing their intrinsic characteristics. Geodesic distances are invariant to pose variations and nearly invariant to shape variations when properly normalized. The proposed method registers two objects by optimizing a joint probabilistic model over a subset of vertex pairs between the objects. The model enforces preservation of geodesic distances between corresponding vertex pairs and inference is performed using loopy belief propagation in a hierarchical scheme. Additionally our method prefers solutions in which local shape information is consistent at matching vertices. We quantitatively evaluate our method and show that is is more accurate than a state of the art method. Kelly, S., Stanley, G., Jin, J., Wang, Y., Desbordes, G., Wang, Q., Black, M., Alonso, J.
Hochberg, L., Bacher, D., Barefoot, L., Berhanu, E., Black, M., Cash, S., Feldman, J., Gallivan, E., Homer, M., Jarosiewicz, B., King, B., Liu, J., Malik, W., Masse, N., Berge, J., Rosler, D., Schmansky, N., Simeral, J., Travers, B., Truccolo, W., Donoghue, J.
Panagopoulos, A., Wang, C., Samaras, D., Paragios, N.
Wang, C., Boussaid, H., Simon, L., Lazennec, J., Paragios, N.
Zeng, Y., Wang, C., Wang, Y., Gu, X., Samaras, D., Paragios, N.
Lima, P., Santos, P., Oliveira, R., Ahmad, A., Santos, J. 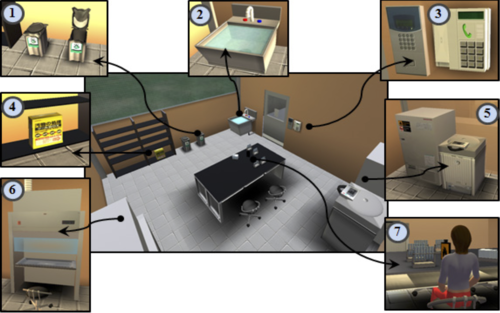 In this paper we describe a cooperative localization algorithm based on a modification of the Monte Carlo Localization algorithm where, when a robot detects it is lost, particles are spread not uniformly in the state space, but rather according to the information on the location of an object whose distance and bearing is measured by the lost robot. The object location is provided by other robots of the same team using explicit (wireless) communication. Results of application of the method to a team of real robots are presented. Vargas-Irwin, C., Franquemont, L., Black, M., Donoghue, J.
Wang, C., Bronstein, M. M., Bronstein, A. M., Paragios, N.
Wang, C., Zeng, Y., Simon, L., Kakadiaris, I., Samaras, D., Paragios, N.
Wulff, J., Lotz, T., Stehle, T., Aach, T., Chase, J. G.
The DIET (Digital Image Elasto Tomography) system is a novel approach to screen for breast cancer using only optical imaging information of the surface of a vibrating breast. 3D tracking of skin surface motion without the requirement of external markers is desirable. 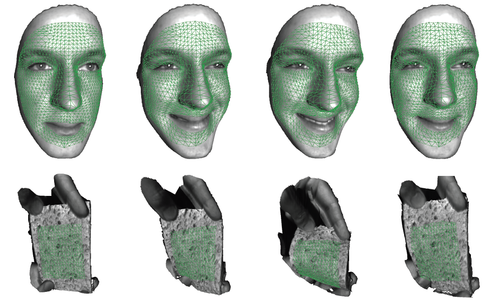 A novel approach to establish point correspondences using pure skin images is presented here. Instead of the intensity, motion is used as the primary feature, which can be extracted using optical flow algorithms. Taking sequences of multiple frames into account, this motion information alone is accurate and unambiguous enough to allow for a 3D reconstruction of the breast surface. Two approaches, direct and probabilistic, for this correspondence estimation are presented here, suitable for different levels of calibration information accuracy. Reconstructions show that the results obtained using these methods are comparable in accuracy to marker-based methods while considerably increasing resolution. The presented method has high potential in optical tissue deformation and motion sensing. Scharr, H., Black, M. J., Haussecker, H.
Wu, W., Black, M. J., Mumford, D., Gao, Y., Bienenstock, E., Donoghue, J. P.
Wu, W., Mumford, D., Black, M. J., Gao, Y., Bienenstock, E., Donoghue, J. P.
Black, M. J., Bienenstock, E., Donoghue, J. P., Serruya, M., Wu, W., Gao, Y.
Gao, Y., Black, M. J., Bienenstock, E., Wu, W., Donoghue, J. P.
Wood, F., Fellows, M., Vargas-Irwin, C., Black, M. J., Donoghue, J. P.
Roth, S., Domini, F., Black, M. J.
Sigal, L., Isard, M. I., Sigelman, B. H., Black, M. J. The detection and pose estimation of people in images and video is made challenging by the variability of human appearance, the complexity of natural scenes, and the high dimensionality of articulated body models. To cope with these problems we represent the 3D human body as a graphical model in which the relationships between the body parts are represented by conditional probability distributions. We formulate the pose estimation problem as one of probabilistic inference over a graphical model where the random variables correspond to the individual limb parameters (position and orientation). Because the limbs are described by 6-dimensional vectors encoding pose in 3-space, discretization is impractical and the random variables in our model must be continuous-valued. To approximate belief propagation in such a graph we exploit a recently introduced generalization of the particle filter. 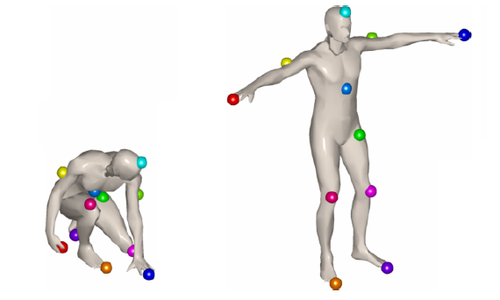 This framework facilitates the automatic initialization of the body-model from low level cues and is robust to occlusion of body parts and scene clutter. 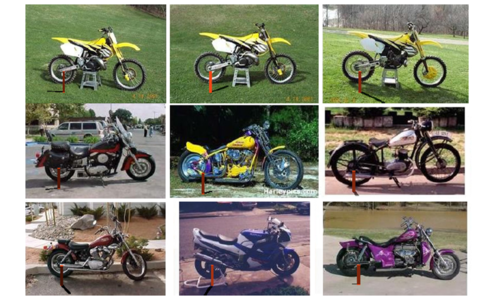 Wu, W., Black, M. J., Gao, Y., Bienenstock, E., Serruya, M., Shaikhouni, A., Donoghue, J. P.
Black, M. J., Anandan, P.
This paper presents a novel approach to incrementally estimating visual motion over a sequence of images. We start by formulating constraints on image motion to account for the possibility of multiple motions. This is achieved by exploiting the notions of weak continuity and robust statistics in the formulation of the minimization problem. The resulting objective function is non-convex. Traditional stochastic relaxation techniques for minimizing such functions prove inappropriate for the task. We present a highly parallel incremental stochastic minimization algorithm which has a number of advantages over previous approaches. The incremental nature of the scheme makes it truly dynamic and permits the detection of occlusion and disocclusion boundaries.